This article is about the Bob Marley & The Wailers song. For the fairytale, see The Three Little Birds. "Three Little Birds" is a song by Bob Marley and the Wailers. It is the fourth track on side two of their 1977 album Exodus and was released as a single in 1980. The song reached the Top 20 in the UK, peaking at number 17. It is one of Bob Marley's most popular songs. The song has been covered by numerous other artists. The song is often thought to be named "Don't Worry About a Thing" or "Every Little Thing is Gonna Be Alright", because of the prominent and repeated use of these phrases in the chorus. The source of Marley's inspiration for the lyrics of "Three Little Birds" remains disputed. They are partly inspired by birds that Marley was fond of that used to fly and sit next to his home. Tony Gilbert, a long time friend of Marley, was present at the time he was writing the song and elaborated, "Bob got inspired by a lot of things around him, he observed life. I remember the three little birds. They were pretty birds, canaries, who would come by the windowsill at Hope Road." However, three female singers from the reggae group I Threes who did shows with Marley claim it is a reference to them. I Threes member Marcia Griffiths remarked, "After the song was written, Bob would always refer to us as the Three Little Birds. After a show, there would be an encore, sometimes people even wanted us to go back onstage four times. Bob would still want to go back and he would say, 'What is my Three Little Birds saying?'" Karen David recorded and released the song on her 2012 EP, Touch. Robbie Williams sings the song in his concert released on DVD. Gilberto Gil recorded and released the song as a single and for his 2002 album Kaya N'Gan Daya. Billy Ocean does a version on his 2005 greatest hits album "The Best Of...". Ziggy Marley and Sean Paul recorded a cover for the 2004 animated film Shark Tale and its soundtrack. also in 2007 for the movie Surf's Up. Connie Talbot released a cover of the song as the first single from her album Over the Rainbow in June 2008. The Postmarks covered this tune on their 2008 lp By the Numbers. Alvin and the Chipmunks made a cover version of this song on their 2008 album Undeniable. Jason Mraz also performs this song in conjunction with the song "I'm Yours" in concerts. Panic! at the Disco's frontman Brendon Urie recorded a cover, which has become well known through YouTube. Elizabeth Mitchell recorded a cover of "Three Little Birds" on her 2006 album "You Are My Little Bird" released by Smithsonian Folkways. Black 47 performed this song for Live In New York City, their seventh album. A version of the song was included on the Fisher-Price's Little People album "Let's Go to the Beach", which featured a number of popular songs performed by the Little People characters. Keith Frank recorded an up-tempo zydeco version with his Soileau Zydeco Band. Toots and the Maytals recorded the song on 2012 release, Ska Never Grow Old. Maroon 5 recorded a version of the song, as a promotional advertisement by Hyundai for the 2018 FIFA World Cup and released it with a music video in June 2018. Former baseball player Shane Victorino, a fan of Bob Marley, used the song's chorus as his at-bat music. During his tenure with the Boston Red Sox, the crowd at Fenway Park would sing along whenever Victorino came to bat. The song became associated with the 2013 Red Sox team, who won that year's World Series. At the Johan Cruijff ArenA, the song is played during Ajax games near the end of half-time. It has become arguably the team's anthem. The song was used in the "Full of Life" ad for Danone Actimel Ireland. In 2012, Marley's oldest child, Cedella Marley, adapted lyrics from the song in a picture book titled Every Little Thing, featuring illustrations by Vanessa Brantley-Newton. In 2013, Marley's son, Stephen Marley, with Jason Bentley, remixed the song for an ad campaign by the automobile manufacturer Hyundai in the United States for their Bluelink in-vehicle telematics system. In 2015, Plymouth Argyle fans sang the song's chorus in a playoff match against Wycombe Wanderers. Plymouth Argyle were losing 3-0 with 10 minutes to go, but after the fans began singing, Zak Ansah and Jason Banton both scored goals and kept the Pilgrims playoff hopes alive. In 2016, the travelling fans of Liverpool F.C. adopted it as they followed their team across Europe. Since then it can now also be heard regularly at their home games. The Milwaukee Brewers baseball team plays the song as fans leave Miller Park after home losses. Monty Alexander recorded a cover of "Three Little Birds" in January 1992 and, in 1999, he released it as a hit single. The cover was also produced by him and, unlike the original, the Monty Alexander version is very Jazz-heavy. "Three Little Birds" was released as the first single by British child singer Connie Talbot on 10 June 2008. It was taken from the 2008 re-release of her 2007 album, Over the Rainbow. Talbot released a music video to publicise the single, which was filmed in Jamaica. The release reached number 3 on the UK Independent Singles Chart, and number 1 on the Billboard Hot Singles Sales chart in the United States. After rising to fame on the first series of Britain's Got Talent, Talbot signed with Rainbow Recording Company and began production of her debut album, Over the Rainbow. The album initially featured several Christmas themed songs, and the first single, "Over the Rainbow"/"White Christmas", was planned be released on 3 December 2007. The single was then cancelled in favour of an album-first release. The album was rereleased with more general tracks to replace the Christmas songs, and one of the new tracks was a cover of Bob Marley's "Three Little Birds". The songs on the album were chosen with collaboration between Talbot and her management; first Talbot and her family wrote "a list of the songs that Connie would sing at her birthday party", and the management then thought "long and hard" about including the more adult songs, including "I Will Always Love You", but Talbot herself insisted. The album was recorded in a bedroom studio, nicknamed "the hut". 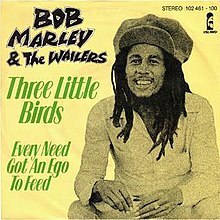 "Three Little Birds" was released as Talbot's first single on 10 June 2008 in the UK, and released alongside the album in the U.S. on 14 October. Rashvin Bedi, writing for Malaysian newspaper The Star, said that "Three Little Birds" was her favourite song on Over the Rainbow. The single peaked at number 3 on the Independent Singles Charts in the United Kingdom, and entered the Billboard Hot Singles Sales chart at number 2, dropping to 3 the next week. It then rose back to number 2, and, on the sixth week, reached number 1. Talbot received attention from the British press because of the single's success, with the Daily Mail and Daily Telegraph attributing her success in America to her appeal to the Christian market, and to the success of her videos on YouTube. Talbot's father, Gavin, spoke about the song reaching number one, saying, "When we received the phone call we were driving back from doing a round of radio interviews in London and Connie was asleep in the back of the car. When we told her she just took it in her stride. I just cannot believe that she is number one in America. We are all very proud of her. It is a big achievement – people have just taken a shine to her." He also said it was "a big shock to hear she was number one. It is tremendous." As of November 2008, the single has sold more than 250,000 copies worldwide. The music video for the single Three Little Birds was finished on June 9 2013. The music video for the song was shot in Jamaica in late March/early April 2008. Talbot was quoted as saying that "going to Jamaica was the best thing I've done this year". The video begins with images of Talbot skipping through a garden, which is then replaced with an image of her singing on a beach. She then joins a child whose parents had been arguing and plays with them and others in a field, then dances with them on the beach. The children are then led to a stage, where Talbot performs as the others sing and play musical instruments. The video closes with Talbot in the garden, skipping away from the camera. After the success of the single in the U.S., the Daily Mail attributed much of Talbot's success to her YouTube videos, mentioning that the "Three Little Birds" music video had attracted more than 82 million views. ^ "Gilberto Gil". Gilberto Gil. Retrieved 2016-10-17. ^ "Bob Marley, Shane Victorino and the Series". ESPN.com. 2013-10-24. Retrieved 30 October 2013. ^ Gonzalez, Alden (2013-10-31). "Victorino's 'big moment' leads Red Sox back to top". MLB.com. Retrieved 31 October 2013. ^ a b Sewards, Lisa (2007-11-17). "Connie gets second bite at stardom as gap-toothed girl shrugs off Cowell's rejection". London: Daily Mail. Retrieved 2007-11-16. ^ "Connie's dream of a hit single". Express & Star. 2008-01-13. Archived from the original on 2008-01-15. Retrieved 2008-02-11. ^ Mason, Kerri (2008-10-10). "Record buyers head-"Over"-heels for 7-year-old". Reuters. Retrieved 2008-10-30. ^ Lopez, Korina (2008-11-02). "'Talent' star Connie Talbot is 7 going on globally successful". U.S.A. Today. Retrieved 11 November 2008. ^ "Buy Connies single today!". Rhythm Riders. 2008-06-10. Archived from the original on 2007-12-13. Retrieved 2008-06-12. ^ "Connie Talbot Soars 'Over The Rainbow' and Up the Billboard Charts (press release)". AAO Music/Reality Records. 2008-10-27. Archived from the original on 2011-07-16. Retrieved 2008-10-29. ^ Bedi, Rashvin. "Over the Rainbow". The Star. Retrieved 11 November 2008. ^ "Connies single at No. 3!". Rhythm Riders. 2008-06-20. Archived from the original on 2008-07-31. Retrieved 2008-08-22. ^ "Hot Singles Sales". Billboard. Retrieved 2008-11-27. ^ de Wilde, Gervase (2008-11-28). "Connie Talbot goes to Number One on the Billboard Charts". London: Daily Telegraph. Retrieved 30 November 2008. ^ a b c "Connie Talbot, 8, the Britain's Got Talent star snubbed by Simon Cowell, breaks America". London: Daily Mail. 2008-11-28. Retrieved 30 November 2008. ^ Harrison, Ruth (2008-11-27). "Album Review: Connie Talbot's Christmas Album". FemaleFirst. Retrieved 30 November 2008. ^ a b Van Guens, Sharon (2008-04-06). "Britains Got Talent star Connie's got teeth". The Sunday Mirror. Archived from the original on 10 April 2008. Retrieved 16 November 2008.